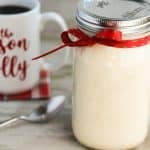 This easy eggnog coffee creamer is made from scratch with just a few wholesome ingredients. Combine sugar and 3 cups milk in Instant Pot and stir to combine. Select sauté – normal. If needed, set a timer for 30 minutes. If using an Instant Pot, the sauté cycle should automatically shut off and beep after 30 minutes. As sugar and milk mixture heats, whisk occasionally. Once mixture begins to foam, stop mixing. Allow to continue to cook undisturbed for the remainder of the 30 minute sauté cycle. When the 30 minute cycle is finished, the mixture should be a caramel color. Foam will appear on top. Remove foam and film and pour unto a medium bowl. To easily remove foam, pour mixture through fine mesh strainer. Clean Instant Pot, then press “keep warm” and add remaining milk, heavy cream, nutmeg, vanilla extract and rum extract to Instant Pot. Stir to combine and heat, stirring occasionally, until heated through- about 2 to 5 minutes. Remove from heat and combine milk and cream mixture with the sugar and milk mixture and whisk to combine. Pour creamer into 1 quart mason jar through fine mesh strainer to strain out some of the nutmeg pieces. (Optional) There will still be plenty of nutmeg in the creamer! Store in quart size mason jar in fridge for 7 to 10 days.